Choose from thousands of spaces in Cambridge - including on-street parking, off-street car parks and thousands of reservable spaces. The quaint and historic university city of Cambridge is easily accessed via the M11 from London, and is not far from the A1(M) via the A14 offshoot which runs directly by the city. Due to its medieval street patterns, on-street parking in Cambridge is difficult, with a limited number of spaces that are mostly reserved for permit holders only. It is therefore recommended to avoid parking on-street in the city where possible, and seek one of the many off-street options available. There are multiple car parks to choose from in the centre of Cambridge, and even 5 park and ride locations surrounding the city that could provide a cheaper parking alternative on your visit. 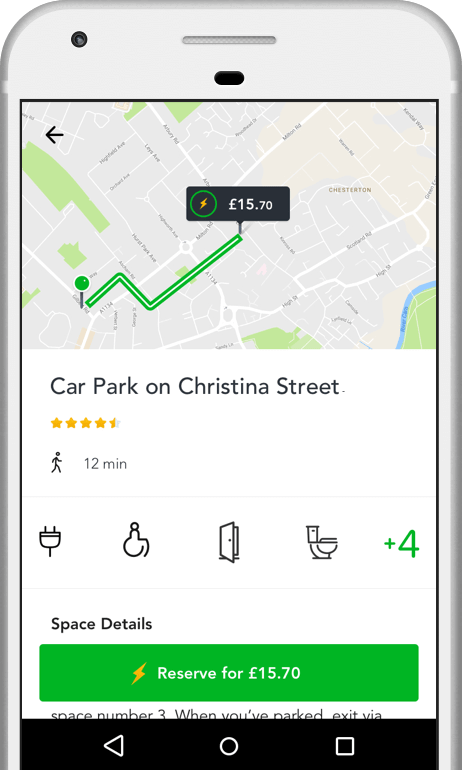 JustPark provides information on parking options across Cambridge – both on-street and off-street, from private driveways to car parks – many of which are reservable. On-street parking is very difficult in the city of Cambridge, with parking almost solely limited to permit holders, especially in the historic centre. It is therefore advised to utilise off-street alternatives when visiting the city centre. Of the on-street pay-and-display spaces available to visiting drivers, there is a limited number available on Sun Street to the East of the city centre – but spaces here offer a reasonably affordable hourly rate. Blue Badge holders can apply for permits and day-to-day access to on-street parking bays. You can use the JustPark parking map to view information about on-street spaces in Cambridge available during your trip. There are a number of convenient and affordable options available when it comes to secure off-street car parks in Cambridge. Cambridge City Council run 5 off-street multi-storey car parks with fares starting at a very reasonable hourly rate. The largest of these car parks is the Grand Arcade car park (Corn Exchange Street, Cambridge, CB2 3QF) in the heart of the city centre, a short distance from the main shopping areas and the university. This car park operates 24 hours a day, Monday-Sunday, and has an especially appealing hourly and overnight rate. A further off-street option is Cambridge Station car park (Station Road, Cambridge, CB1 2JW) operated by NPC. You can park here and travel on by train or bus to wherever you desire. This car park caters best for long-stay and overnight parking, with its 24/7 operation. There are also 5 park and ride locations surrounding the city, which all offer very attractive hourly and daily parking charges. With over 750 parking spaces and disabled parking available, park and ride is a great option – with only a short onward commute via public transport to get in and out of Cambridge centre. JustPark offers a selection of reservable off-street spaces in Cambridge – in both council and commercially-run car parks, as well as at hotels, offices and on private driveways. You can browse these options and book a guaranteed space via our website or app. Cambridge train station is situated in the southwest corner of the city, and acts as the city’s principal station and main hub for onward transport links. Cambridge North station, in the northwest Cambridge suburb of Chesterton, serves as an alternative transport link for the city and beyond – with close proximity to park and ride facilities and local bus routes. Disabled parking is widely available in Cambridge, with most off-street car parks offering multiple disabled spaces – in both the city centre and in all 5 park and ride locations surrounding the city. Blue Badge holders can park for free for up to 3 hours at Cambridge City Council’s Grafton East, Grafton West, Park Street and Queen Anne Terrace multi-storey car parks. Blue Badge holders may also apply through Cambridge City Council for permits and day-to-day access to the heavily-restricted parking bays in the historic city centre. You can also filter when searching on JustPark to show all our parking spaces with disabled access in Cambridge (select this option by clicking on ‘Filters’ on the search results page). Parking in Cambridge is heavily restricted every day of the week and is enforced by Cambridgeshire Police – so be careful to ensure you are not parked illegally in any area of the city centre, at all times of year. On the JustPark map, we’ll only show you spaces which you’re allowed to park in and are not restricted at your time of searching. Refer to the other sections above, as well as local signage, for further specifics on parking restrictions. Cambridge City Council’s off-street car parks make no distinction in fares on Bank Holidays and weekends – only having differing day and night rates which are applicable to all days. NCP’s station car park, however, offers a discounted rate on Bank Holidays and weekends – matching their overnight rate on these days. The majority of Cambridge’s off-street car parks offer overnight parking at competitive rates (including those listed in the above ‘off-street section). The University of Cambridge is one of the world’s most famous institutions and its presence is hard to avoid when in the city. You can admire the beauty of the colleges’ and neighbouring chapels’ grandiose gothic architecture as you drive or wander through the old medieval streets. Equally, you can enjoy the city by punting down the River Cam, with impressive views of Magdalene College, King’s College and several others. With rolling greens and parks and historic landmarks, Cambridge is a pleasure to park up in and visit throughout the year. Rated 5 stars with an average satisfaction rating of 96%, JustPark is the UK’s favourite parking service. But don’t just take our word for it – check out some of the latest customer reviews for our Cambridge parking spaces at the bottom of this page.